Stay interviews are a proven method of decreasing turnover and increasing retention. 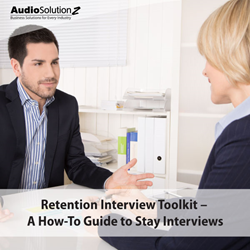 AudioSolutionz, a division of corporate education leader ProEdTech, will host the live webinar “Retention Interview Toolkit: A How-To Guide to Stay Interviews” with industry veteran Wes Pruett on Tuesday, February 13, 2018 at 1:00 pm ET. Wes will outline a plan of action to increase your chances of retaining your most valuable employees. Across the country, increasing employee turnover is expected to continue, costing companies valuable productivity and effectiveness. That’s why it’s more critical than ever to hold onto your high-skills staff. One emerging solution is the stay interview. Stay interviews have the benefit of increasing employee motivation, engagement, development, and empowerment, according to Pruett. Stay interviews identify areas of retention risk, offer a proactive solution for managing that risk, and allow you to target your retention efforts on high-impact employees. Not sure what your retention efforts should look like? You’re not alone. Most companies see retention as a key strategic imperative, however, less than half have a specific retention plan. And most retention plans are overly general, expensive, and have little positive impact on turnover. Instead: Stay interviews offer a specific, directed, and effective solution to the turnover problem. This interview tactic digs deep into the reason why an employee is likely to stay—or leave—and then develops a customized retention plan for that employee. In this session, expert speaker Wesley Pruett will not only guide you through the steps of conducting stay interviews but will also arm you with a practical toolkit that contains: a supervisor’s pre-interview sheet, a staff questionnaire, specific questions to ask (in 10 key areas), an individualized retention plan document, and a retention tracking form. This retention toolkit will help you get at the source of your turnover problem and allows you to work collaboratively with employees to promote productivity and growth—for both personnel and the company.